Shelley Bean: It's My Party! Hello stampers! I wanted to let you know about a very special event that is coming up this Sunday, February 21, 2016. It's my birthday! And because I care about all of you that have taken the time to be my follower the past years or even recently, I want to give one person a gift from me! Now through Saturday night (Feb 20th), 11:59 PM, anyone that does at least 2 out of the 3 of the following, and leaves a comment, to let me know, is eligible to be in a free drawing for a free stamp set. This will be a clear mount, brand new stamp set. I can mail it to any anyone with an address in the United States. Along with the stamp set I will include a card made with the stamps of this set and enough supplies for you to make 3 more cards for yourself! It's a pretty great deal. Here is the finished card sample of the card kit I will including. Along with the limited time stamp set, I will also include a generous sampling of the limited Perfectly Artistic Designer Paper that is also going, going, gone as of today. What this all means is, today, Feb 15, 2016, is the very last day you can order from Stampin' Up and receive either this stamp set or the Perfectly Artistic Designer Paper as a free item for every $50 purchase. This means, ordering it today or entering in my drawing may be the last opportunity you have to own it for yourself. Thank you for being with me through all the transitions of this blog. I truly appreciate you and hope you will continue to come visit for more content and ideas. In the upcoming weeks, I plan on sharing some step by step and video tutorials, as well as more giveaways and fun things. Also, because our SaleABration is not over yet, stay tuned this week as I share a few NEW items, not yet revealed that will also be FREE with any $50 purchase. Of all days for me to come over to visit you, I visit on your Birthday! Happy Birthday to you Shelley!!! I can't even tell you how Excited I am about your giveaway. 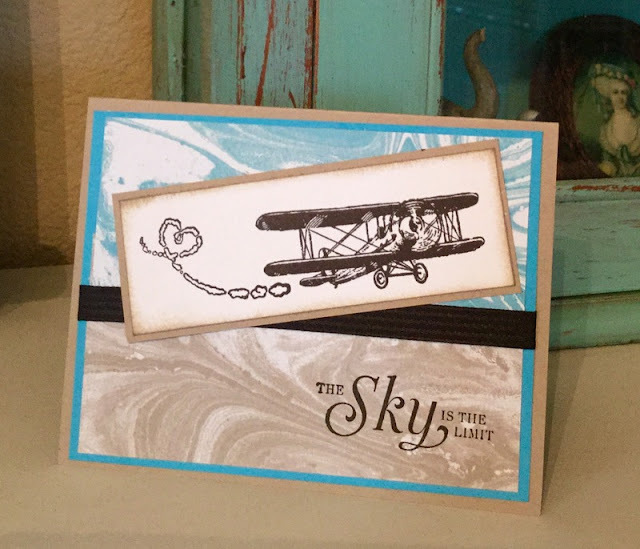 I was just talking to my sister the other day and she told me that she had gotten The Sky's the Limit Stamp Set. I told her how much I wanted It and that I was a little jealous of her and now I have a chance to own the Set. I posted a link on my Facebook page to all my family and friends and I also put your Blog Badge on my Blog. I don't have a g-mail e-mail. Hope my regular e-mail is o.k. Please let me know. Thanks SOO much for the chance to win! Love your card!!!! Love the stamp set and how did I not even notice that paper in the catalog??? So cute!! Followed and Shared on Facebook.